Giannotti’s new solo release, The Great Unknown is an ambitious project consisting of seven lengthy pieces. It’s rich textures along with melodic guitar and flute reveals new layers with each additional listen. Listens that you should take your own sweet time in allowing to free flow gradually over you, trust me. From his roots in progressive classical art rock and with occasional medieval flavors, this offering maintains interesting intricacies while still creating a broad appeal with skill and creativity. Robert Giannotti is what makes this album what it is, so to speak. The man is EVERYTHING to, and on, this project, and rightfully so. Seemingly having put his mind, body and soul into The Great Unknown, the prog rock specialist has brought forth an album chock full of real heart. 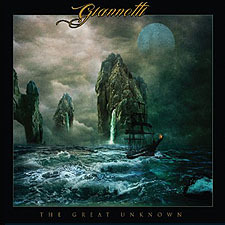 As a whole, The Great Unknown - to my mind, at the very least - is a progressive rock masterpiece, but as you explore each one of the tracks, inclusive of the near-12 minute opus of a title track, you quickly realize that Giannotti has tremendous vision also. Sure, there is no way any new prog rock album can steer completely clear of possessing elements of prog rock legends such as Yes, Jethro Tull or even ELP, but why should/would they? These aforementioned bands, and many others, actually created the music that has become the musical foundation for Giannotti's most fevered desire, and man, he represents himself rather nicely in the mix regardless, don't you worry. In closing, Giannotti - yes, I agree, that IS a brilliant last name to have in this business - is an incredible musical talent. His writing, his composing skills are at the fore right now, and the way he gives his all, leaving nothing at the door, is enough to make me believe we will be hearing a lot more of this wondrous talent for many, many years to come.